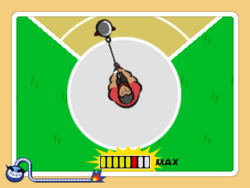 I'm Gonna Hurl is a microgame found in WarioWare: Touched! in the Slightly Unscrewed stage and returns in WarioWare Gold as one of Young Cricket and Master Mantis' microgames. Its name is a term used when a person feels as if they are about to vomit. There is also a souvenir based on it in WarioWare: Touched! called Big Hurl. 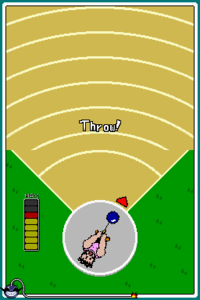 The objective is to spin the hammer and release to throw it, similar to Hammer Throw. This game has more time to complete than other microgames, due to the time it takes to wind up the hammer. If the hammer lands on the grass part, the player will lose the microgame. 1st level difficulty: The field is enormous, with no grass parts. 2nd level difficulty: The field is big, and includes a small grass part. 3rd level difficulty: The field is not as big, and grass parts appear more than field parts. This page was last edited on April 22, 2019, at 10:29.